Mareyah Abbas, student of HU’s Communication and Design course ‘Forms of Inquiry’, writes a blog about how a field trip to the Karachi Biennale Festival, 2017, empowered the students to put their book-learned knowledge to practical use. Dr. Marco Grosoli and Saima Zaidi’s Forms of Inquiry students were taken on a trip to the Karachi Biennale Festival, 2017. We were taken to four locations, all of which were in parts of Karachi that are not generally seen as artistic landscape. The first location was the NJV Government Higher Secondary School, and the fourth being Pioneer Book Store, located in the heart of Saddar. 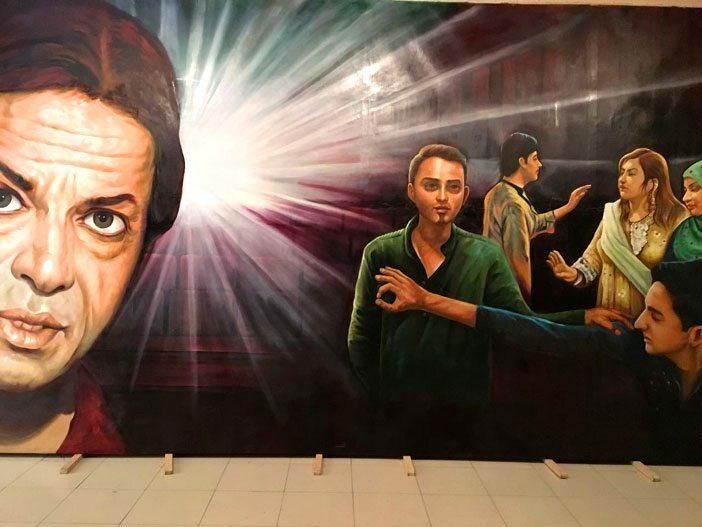 The locations of the different art exhibitions show how the community has an opportunity to explore the art being displayed at venues that still hold old artistic value from the old days of Karachi. For example, the Pioneer Book Store, a store that existed before 1947’s partition between India and Pakistan, has been struggling to stay in business. The location was chosen to display works of famous artists where observers can also take in the majesty of the old building and appreciate the way the building was well-kept, a rarity in our city. 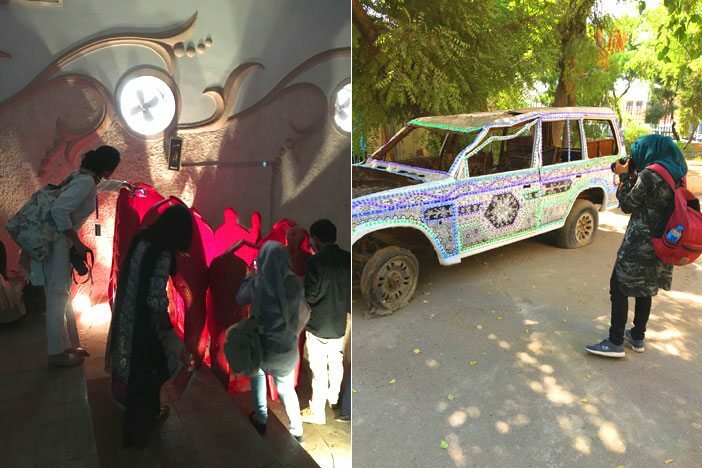 The course Forms of Inquiry includes an understanding and appreciation for art in all forms, and the Biennale worked as a gateway between our classroom and the streets of Karachi, allowing us to witness art in its physical form. We were able to take what we had been learning over the past few months and use that material to interpret the art that we saw at the different locations of the Biennale. Most of us being art students, were thrilled at the prospect of being able to observe what the Biennale had to offer us, and though the day was a hot one, our excitement heightened with each new location that we were taken to. Each location contained different artwork providing a variety of options to choose a favourite from. Yet, each piece managed to somehow enthrall the viewers. Most of the art had also found a way to include some form of Pakistani culture and heritage. 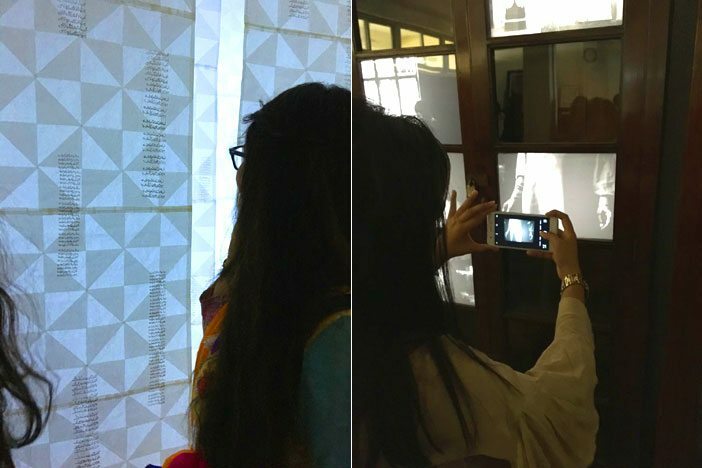 One of the pieces included a curtain that had handwritten Urdu poetry written about the times of partition and the difficulty with which people struggled to migrate. The Biennale also showed us how the founders had sought to find a way to include not just the middle class or upper class, but in fact, everybody, as the entry for each location was completely free, and anyone had the chance to enter and observe the art. 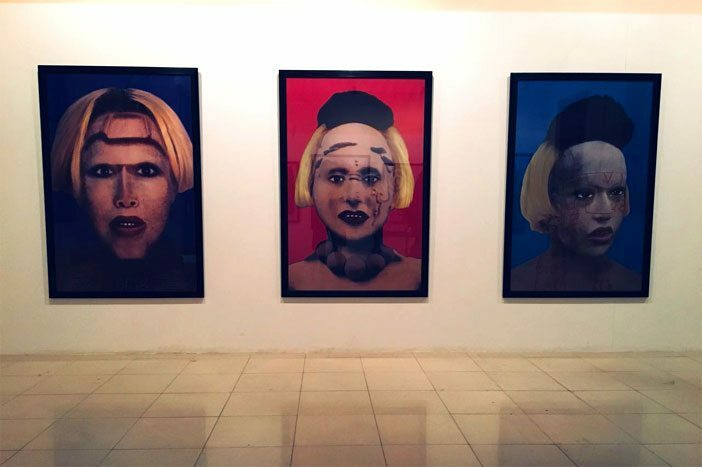 It was a way to include all of Karachi, and for artists from many different regions to display their works for an unlikely audience. Yoko Ono and Sharmeen Obaid, were two out of over a hundred others whose work was displayed in the Biennale. Perhaps the best part of the trip was being able to put our book-learned knowledge to practical use. Being able to step onto the streets as a student allowed for us to understand the art not just as an observer, but as people who understand the depth of the artwork showcased. This blog was written by Mareyah Abbas, Freshman at HU’s School of Arts, Humanities and Social Sciences, majoring in Communication and Design, Class of 2021.